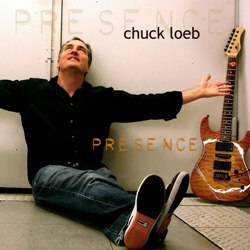 … it's Chuck Loeb in the spotlight with Presence, In hour 2 it'll be all the latest & best in new music on the Fresh Trax segment. Headlining are Jeff Golub & Keiko Matsui. New to the show is saxman Andrew Neu; we have the Atlanta-based band Outta Nowhere while rounding the set on keys is Nate Harasim out of San Diego. Other highlights include a terrific retro pack with The Jazzmasters, Rick Braun, Peter White, Ken Navarro, and Warren Hill! As well there's Fattburger, The Rippingtons, Joe Fuentes, Terry Disley, Joe McBride, Walter Beasley, Lao Tizer & others! Program #450: t-minus 7 and counting! 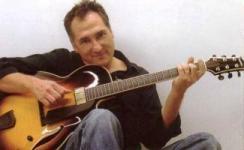 A native of a New York City suburb called Nyack, Chuck Loeb began guitar at the age of eleven and for many years, he taught himself everything that he knew about playing. Learning all the top pop songs of the day, Loeb began to perform at the age of 13; but, at around 16, he discovered jazz and his style began to change, the music of Wes Montgomery and John McLaughlin proving particularly influential. At much the same time, Loeb realized that he would need to study music formally in order to reach the level of technical expertise he hoped to attain. Consequently, he traveled as far as Philadelphia in order to take lessons before connecting with jazz great Jim Hall in NYC - he studied with Hall for his final two years in high school. In order to pursue his formal training, Loeb enrolled at Berklee in Boston, but after two years of intense study, the lure to perform professionally led to his departure in 1976. Relocating to NYC, he made a name for himself as a sideman with jazz luminaries such as drummer Chico Hamilton, flutist Hubert Laws and various others, while often practicing up to eight hours a day. This all served in attracting the attention of Stan Getz, who in 1979 invited Loeb to join his band! Loeb toured with the legendary sax player for nearly two full years and credits this period as critical in his development as an artist - learning the true value of every note that he played. Upon leaving the Getz band and after hundreds of sessions on the NYC studio scene, Loeb released his debut in 1988. Achieving a rare mix of critical acclaim and commercial success, Chuck's catalogue has now grown to 15 albums strong yielding several top 10 tracks including three #1singles. Concurrent with his solo career, Loeb recorded with a band called Metro, a four-piece contemporary jazz combo that included keyboardist Mitch Forman and drummer Wolfgang Haffner - Metro cut four albums between 1994 and 2002. In addition, he played with the Fantasy Band recording three albums in the period from 1993 to 1997. Meanwhile, Chuck's production expertise is another aspect of his career, which has continued to flourish over the years, having worked with the likes of Bob James, Michael Franks, and Spyro Gyra among others. For the most part we're up to date, today's focus being Loeb's latest release and his Heads Up record label debut Presence, so entitled in recognition of the human element involved in making an album. Loeb explains, "'Nowadays, there's a lot of music that gets created in a laboratory... We all have computers, and we do things long distance. But it never ceases to amaze me how, as soon as you put the live musicians into the equation; it's their presence that brings the thing to life. That's the idea behind the album title - the effect that an individual's personality has on the music, both in the context of a recording and in a live setting.' " ~Courtesy of Heads Up. However, on an entirely different level, there may well be a much deeper meaning, call it reverence if you will. On the cd cover, Loeb is pictured sitting on he floor looking upward with his hands outstretched, that in conjunction with tracks such as Window of the Soul, leads us to believe perhaps there is a more spiritual component to the entire affair. Regardless, the music makes this release another outstanding project and the focal point for our feature - starting with a track highlighted by the saxwork of Andy Snitzer (Snitzer and Loeb had previously worked together back in The Fantasy Band) and by Spyro Gyra's Tom Schumann on keys. It's called Hangin' With You! The aforementioned Window of the Soul starts up hour 2 while our closer sees "Loeb take a Latin turn with the help of his wife, Spanish-born vocalist/guitarist Carmen Cuesta-Loeb" on Llevame, a revamp on a track the husband and wife team wrote more than two decades ago, when they were part of a band called Paralelo! In any event, it's another outstanding project from the man who makes the most of each and every note that he plays and an exceptional showcase feature! 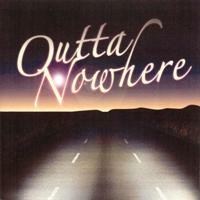 Out of the Northern California Bay Area, comes the band Outta Nowhere, a four-piece unit comprised of California natives, Melvin Jones on keys and Steve Jackson on guitar, with Aaron D. Hearne and Michael T. Dennis on bass and drums respectively. With backgrounds in jazz, funk, and R&B, the band members have enjoyed playing with the likes of Tower of Power and Anita Baker and collectively they've performed at a variety of venues and events thru-out Northern California. With an ability to blend their styles and experiences into a unique, upbeat and yet mellow sound, the contemporary quartet hopes to revitalize the sound of smooth jazz with an energy that will touch audiences. From their self-titled debut, we present this creative combo's fresh musical spin on the track Backspin! 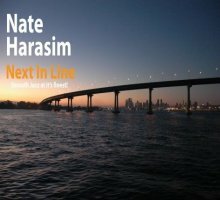 After listening to his keyboard wizardry, Nate Harasim may very well be "next in line" to crack today's smooth scene much as the title of his debut cd suggests. Harasim took his first piano lessons around 20 years ago and early on he envisioned entertaining the masses. At sixteen, he formed MoJazz, a group that played straight-ahead jazz - they went on to open for the likes of Norman Brown and Pamela Williams. In spite of his efforts to keep the group together, the players went their separate ways after high school - for his part Harasim enlisted in the US Navy and for a time jumped out of helicopters as a rescue swimmer. After completing his tour of duty, Nate set up shop in a small apartment outside of Detroit and began work on a solo project - but when he obtained an endorsement deal as a Yamaha performer, Harasim moved to San Diego where he'd been stationed. Connecting with trumpeter Mitch Manker - who's played with Fattburger and 3rd Force - and bassist James East - Fourplay Nathan East's younger brother, who's played with Sergio Mendes and toured with the Commodores and Sting - Harasim started doing a few sessions. Within a couple of years his Next In Line debut was born. Suffice it to say, with no shortage of superb material on this exceptionally well-crafted project that he arranged, wrote, produced, and engineered, Harasim could very well be first in line in so far as break thru projects in the year. From that effort, we've selected the exuberant title track! On Café Jazz, we're continually on the prowl for sounds that are exciting and fresh - so here now is a great young player whose music not only fills the bill quite nicely, but whose name also perfectly encapsulates that sentiment of newness. 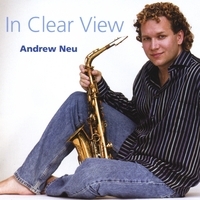 I'm referring to Philly-based saxman Andrew Neu. As an active member of the vibrant Philadelphia music scene, Andrew Neu is a first-call player who's also garnered a reputation for his compositions and arrangements. He's recorded with dozens of local bands while sharing the stage with many top acts - a diverse list that includes Sister Sledge, The Four Tops, The Temptations, Mel Torme, Rosemary Clooney, Englebert Humperdink, Manhattan Transfer, Randy Brecker, Nestor Torres, Bob Mintzer, Kim Waters, and Gerald Veasley. Since 1996, Neu has performed with the Philly Pops while playing a variety of jazz festivals too numerous to mention. Jacked by the positive response to his 2000 debut, Neu has just released, In Clear View. Employing a slew of big name artists, among them Jeff Lorber, Dave Weckl, Vinnie Colaiuta, Gerald Veasley, and Doc Gibbs, the project was produced by Brian Bromberg. From that sophomore venture, we have Neu's rich & silky blend take on a Kevin Toney penned track! "Sometimes you hear guys like Jeff Golub, who used to back rockers like Rod Stewart, referred to as 'former rockers.' I've seen Jeff play live. There's no 'former' about him. He's still a rocker! 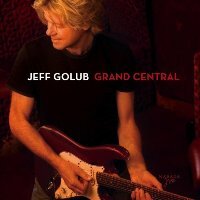 And with his latest release, Grand Central, Golub brings on the feel and flavor of New York City with tracks that cover everything from jazz to blues to rock." In a career quickly closing in on the three-decade mark, Keiko Matsui has achieved a virtually unparalleled level of artistry emerging as one the most respected performers in contemporary jazz. With sold-out appearances around the world and with well over a million units sold in the US alone, Matsui's latest cd brings her output string to 21 releases, yet it is first that she has produced on her own. In May 2006, Matsui travelled to South Africa where she has performed many times before - however, the purpose of her visit on this occasion was somewhat different as she had in mind to spend some time there in order to get the feel of how people lived and to write some songs. Keiko confides, "Sometimes I would take off into the countryside to spend time alone in the beautiful nature, and I was very inspired by it." She continues, "To me, music is like a prayer, it is a very spiritual thing. I think that music has a magic power. I think music is something that the universe or God gave us to combine together. Beyond a culture, beyond the history of your country, you can reconnect with the music, so those spiritual elements are important to me for my music." ~ Interview excerpt courtesy of All About Jazz . 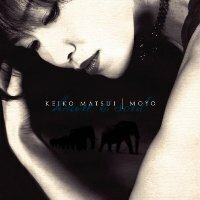 Borrowing the title for the project from the Swahili word for "heart and soul", the cd is indeed a spiritual journey, as Keiko shares her experiences chronicled thru her music. Among others, Paul Taylor contributes to the disc, making Moyo a reunion project of sorts - after all, it was Matsui who initially "discovered" Taylor. He was previously a band member and played on Matsui's Sapphire release, her seventh album. That element of camaraderie radiates on After the Rain, one of our faves from what may well be a landmark release! On this edition, Nils is featured on Then & Now - we've selected three tracks, one from each of Nils' three releases - and that's coming up about 20 minutes in. Otherwise, new music rules the day with a tasty complement of 11 brand-new and never-before-been-played-on-our-show tracks. Today's line-up includes Maysa, Special EFX, Down to the Bone, and Jeff Lorber. There's more from Dotsero our favourite Denver based band. New to the show are the sounds of saxman Dee Lucas. We have the latest from Acoustic Alchemy, Jay Soto, and Don Breithaupt - keyboardist & headman for Monkey House, while also appearing are Dee Brown and Molly Johnson! Nils: As we reported earlier this year, when showcasing Nils (pronounced Neels) and Ready to Play, undoubtedly, "the" smooth jazz story for 2005 was the issue of Pacific Coast Highway. Although the track proved to be #1 on just about everyone's year end list of favourites, this belay the fact that the German-born guitarist had been honing his craft as part of the vibrant LA scene since the mid-80s. Nils, whose full name is Nils Jiptner, took up guitar as a teen, but found the educational & professional opportunities in Germany somewhat limited. Moving to the US in the mid-80s to study composition, arranging, and film scoring, Nils set up shop in Southern California. While making some inroads in film and television, he got his first job as a guitar teacher and started doing sessions as a rhythm guitarist. He appeared on George Benson's 1998 Standing Together and contributed a track to the project - later that same year Benson returned the favour, writing a tune for & playing with Nils on his Blue Planet debut. Although it's difficult to trace the exact chronology for the events, 1998 proved to be a busy year. Nils came to the attention of top producer Paul Brown, who enlisted him for releases by Gabriela Anders (Wanting) and Rick Braun (Full Stride) - both issued that year. Then the following year, an opportunity with The LA Jazz Syndicate resulted in Nils appearing on the second "Syndicate" project - he played on several tracks, but most notably, he was the featured performer on Summer Nights, a track that he later reprised for Pacific Coast Highway. In spite of a lag of several years between his solo releases, Nils stayed active composing for TV and film while at much the same time, he began writing, arranging, and recording solo tracks in his home studio. Allowed the luxury of tweaking certain elements, Nils also experimented with his sound, all of which resulted in PCH. Following its success, things changed considerably for the Man from Munich so dubbed by Smooth-Jazz.de in their glowing review of PCH. In the past, touring had been a missing piece in the musical puzzle - but with a skyrocketing profile, this aspect of Nils' career has really taken off - hence his third and latest release was suitably entitled Ready to Play. With its issue, the timing too for a Nils Then and Now feature seemed to be perfectly at hand, which all brings us to the trio of tracks that we've selected specifically for that purpose. To open things there's Cruisin' from the Blue Planet cd featuring the saxwork of Rastine Calhoun. That's followed by the behemoth hit, the title track from PCH, while Midnight Breeze with Nils at his lyrical best caps off the presentation!